The golden lights shine as night settles in around the Rifflin'Hitch Fishing Lodge in Southern Labrador in Newfoundland Labrador, Canada. Guests at the Rifflin'Hitch Lodge in Southern Labrador, Canada can stroll the boardwalk which winds around the fishing lodge. As night begins to settle in, the golden lights from the interior of the lodge shine across the landscape along with the exterior and boardwalk lights. 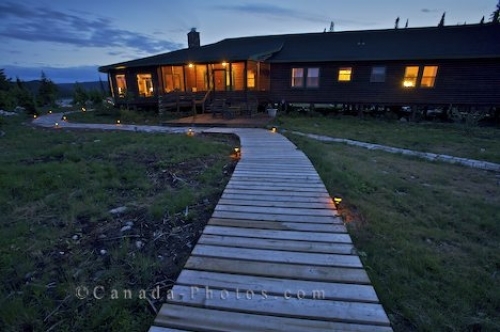 The wilderness which surrounds this fishing lodge is amazing and the only sounds which are heard across the region are sounds from the night time wildlife. Rifflin'Hitch Lodge, Eagle River, Southern Labrador, Labrador, Newfoundland Labrador, Canada. Photo of the night lights illuminated around the fishing lodge and along the boardwalk in Southern Labrador, Canada.